I’m desperate to buy my daughter a doll house but I simply cannot choose one! I was all set to take the plunge this Christmas but just when I narrow my choice, I spot something new and even lovelier than the last. The Rayray Doll House by Momoll of Switzerland just hit my doll house radar and it ticks all the boxes for me. The house is made of birch plywood slats that slot together for easy assembly and storage. It features a hinged roof to reveal a secret attic. I like the simplicity of this chalet style house and the fact that the rooms aren’t ‘pre-designated’ as bedrooms, living room and so forth. 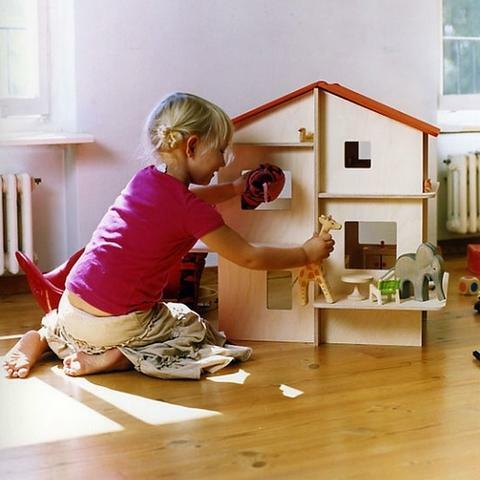 Children will make the most of the open layout including the ledges and balconies – it’s a doll house that can be played with from all angles. I also like the fact that it can be disassembled and stored flat or easily taken with you, wherever you may be going. 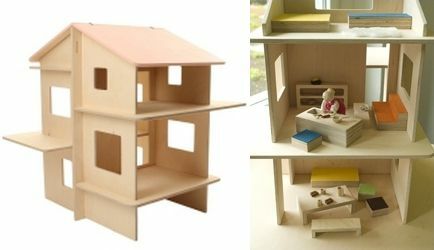 Also available is the Legno furniture set so that you can furnish your doll house with befitting simple designer pieces. The Rayray Doll House is available directly from Momoll for CHF259 (equates to approximately AUS$285). Momoll deliver internationally.